It is not easy when a nurse is on the receiving end as the patient. Today I had an IV started in my right forearm for an outpatient procedure. Nothing serious, just a screening procedure highly recommended when one reaches a certain birth number. I was a bit anxious but when the pre-op nurse started my IV, I paid close attention. Nurse Jeni was a very sweet and nice nurse although her first move when looking for a vein was to check out my antecubital fossa. In my head, I was thinking, Oh no please, not my antecubital area, you are starting an IV, not drawing blood! I was relieved when she announced that I had no good antecubital veins and she was going for a vein below and lateral to the fossa. I watched as she donned her gloves, (good), cleaned the IV site with alcohol (hmm…), used a 20g safety IV catheter (good), did it swiftly with one stick (good) then anchored my IV site with non-sterile tape she peeled and stucked on the side rails for easy reach (OH NO!!). Not knowing that I am nurse (or an infusion nurse at that), I asked if she can use a transparent dressing, to which she replied, “Oh we don’t use that here, only at the hospital, plus you will need your IV only for an hour”. She proceeded to attach the IV tubing of 0.9% Normal Saline and anchored the tubing with another strip of (transpore) tape. Ugh…the IV site was uncomfortable because of the tape. Before I could say anything more, I was quickly wheeled into the procedure room and was given meds for sedation. I watched the procedure nurse wipe the IV port with alcohol (good) then pushed 2.5mg Versed and Demerol 25mg one after the other. That’s was it and I woke up in the recovery room. The procedure was quick with good positive outcome and I was discharged to home. So what’s the big deal, well when I looked at my right arm after sleeping all day, this is what I saw. Oh yes, phlebitis grade 2! Ok, they did say on the informed consent that “medication phlebitis” may be a complication post procedure; but as an infusion nurse, I know there are things that can be done to prevent this. Here are my thoughts. 1. Use the proper IV site dressing whether or not the catheter stays in for an hour or days. In addition, the use of a stabilizing device would prevent the movement of the IV catheter at the site. My IV moved as I moved my forearm, I could have used a stabilization device and that could have prevented the phlebitis I got. For more information on stabilization, check this site. 3. Apply continuous pressure to site after discontinuing a peripheral IV. Check site for bleeding. My IV site was bleeding underneath the band-aid after the IV was removed. No one noticed but my ‘designated driver” who was at my bedside. 4. Perhaps even the selection of a proper IV site would be helpful, particularly since these medications can cause phlebitis. 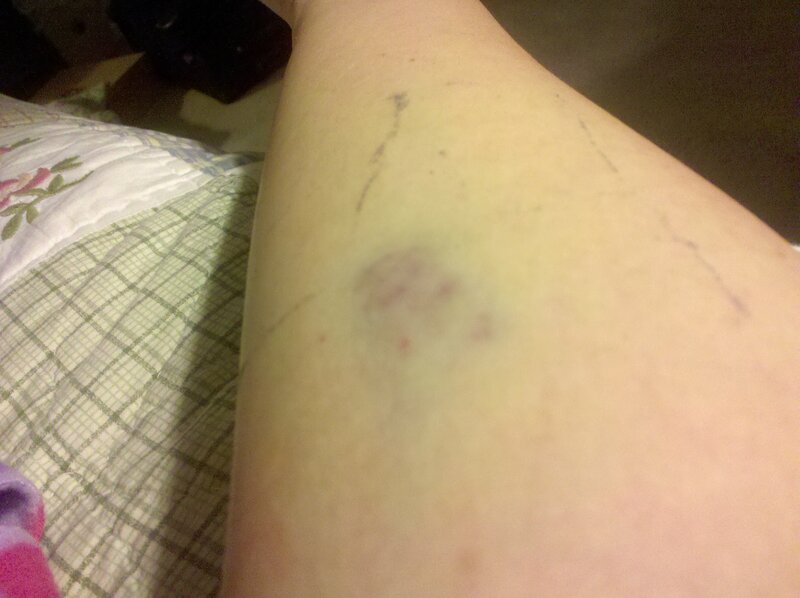 I wonder what my antecubital area would have looked like if Nurse Jeni found a vein there. 5. Include in the post procedure patient instructions what to do in case of phlebitis like mine. My instructions sheet did not even mention anything about my IV and/or phlebitis. Luckily, as an infusion nurse, I know what to do. 6. Although I did get good care, the recovery room nurse seem to be in a hurry to scoot me out the door, drowsy or not. In the picture, you can clearly see the outline of where the tape was applied. I would have expected them to at least to clean it up, that won’t take but a few minutes. I do remember reading about my patient’s rights, and I just might tell them about my thoughts so the other patients can avoid having these awful looking arms. On the other hand, if we are the nurses caring for the patient, please let us not forget these simple things that could prevent “preventable” complications such phlebitis.